Felon Bernard Kerik's associate Elizabeth Guzman subtweets death threat allegedly aimed at co-author Plaintiff in From Jailer to Jailed Litigation. This blog has reported incidents of alleged threats, harassment, abuse and potential crimes perpetrated by or in the name of felon on probation Bernard Kerik against his co-author Plaintiff in the "From Jailer to Jailed" litigation. Yesterday, we were alerted to yet another threatening death threat "sub-tweet" seemingly by Elizabeth Guzman a serial abuser on twitter. The background sub-tweets "Before you embark on a journey of revenge, dig two graves". This disturbing twitter profile background was changed seemingly in conjunction with the initiation of a US Federal Probation investigation into possible probation violations by Bernard Kerik as it relates to the threats, intimidation and harassment of his co-author Plaintiff in the "From Jailer to Jailed" litigation. The timing could not be more damning for Kerik who is serving another year of federal supervised release. Kerik's friends may be too dumb or zealous to realize they are doing him no favors in their macabre support. This crazy idiot, Guzman, has been reported to twitter 72 times by the co-author and others. Elizabeth Guzman is also a person of interest in a telephone aggravated harassment, terroristic threats among other allegations reported by the co-author Plaintiff. 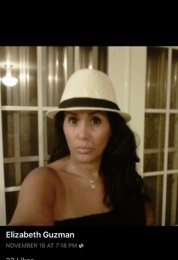 Guzman has, to date, escaped law enforcement by the Clarkstown Police and the New York State Police. She's an idiot but rumored to lick an old geezer lawyer's you-know-what to support herself so she's protected. 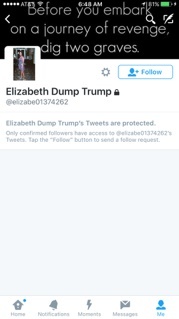 Elizabeth Guzman tweets all day long, posted the threat coinciding with a recent complaint to the US Federal Probation Department against her bud, Bernard Kerik, but has since locked her tweets. However this taunting, death threat sub tweet remains. 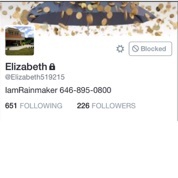 Elizabeth Guzman is reportedly a "marketing executive for IAMRainmaker". This role and this company doesn't exist except in Lizzie's troubled head so we pity her. However, that's not a good defense for allegedly threatening, harassing innocents allegedly in the name of FELON ON PROBATION Bernard Kerik. 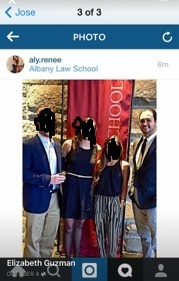 Lizzie has a son, Michael LaBolita, who reportedly attends Albany Law School. He'll have to hurry up and pass the bar real quick to help her though. It is reported this investigation is ongoing. Elizabeth Guzman, a reported close pal of felon on probation, Bernard Kerik, is only one of about six persons targeted in this latest ongoing investigation of this alleged criminal behavior. You would think TWITTER.com would do something but they play dumb except when "celebrities" or "twitter high rollers" complain. All dirtbags cited in this blog are innocent until proven guilty. The most dangerous criminal is the one who knows the law, commits a blatant criminal act then runs away just shy of prosecution. 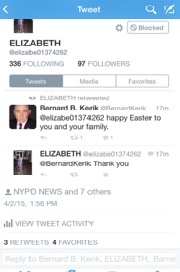 Bernard Kerik and "associates" have allegedly committed many criminal acts over the last two years. It took the Southern District of New York a decade to send felon on probation Bernard Kerik to prison. This case may not take quite as long to have Kerik return. Stay Tuned.